It has not been even 6 months since Dhafer Youssef has given a fantastic concert in Ankara Jazz Festival with his fabulous quartet. 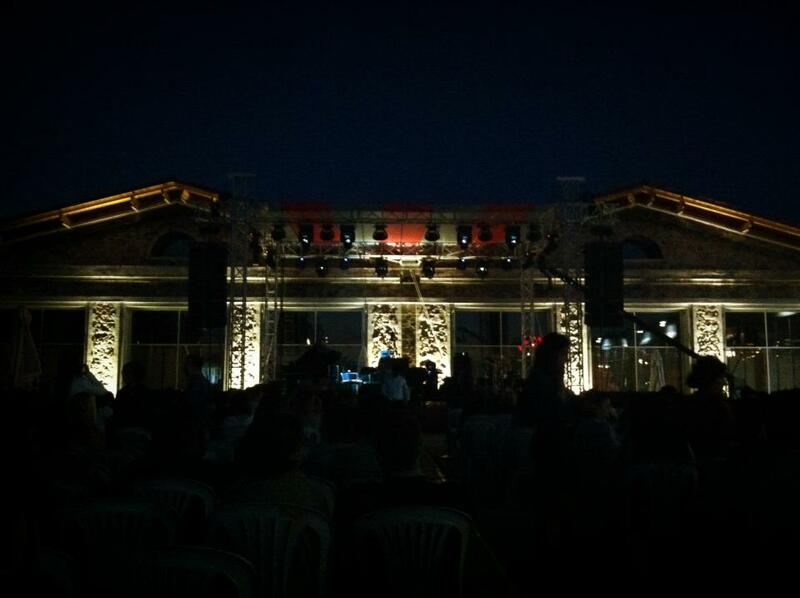 This time, the nice square of Cer Modern Art Center was the concert place yesterday for this fantastic musician. In addition to their quartet configuration (Dhafer Youssef, Kristjan Randalu, Audun Erlien and Chander Sandjoe) we had Eivind Aarset on guitar, Hüsnü Şenlendirici on clarinet and Aytaç Doğan on kanun. The band has previously performed with Hüsnü Şenlendirici and Aytaç Doğan in İstanbul and North Sea Jazz Festivals and gathered very good reviews. Many of latest performances of Dhafer Youssef are including his great compositions performed with a tensional and energetic European Jazz style. He is using his oud and incredible vocal to give the oriental taste. He is not only a member of the band but also a conductor directing the transitions and solo performances. I think it is a great idea to include Turkish musicians to the band and what we see as a result is proving that the musicians are really excellent choices. Hüsnü Şenlendirici has real good reputation among musicians all around the world. My questions in some of my interviews were for learning European musicians’ knowledge for Turkish music and musicians. Not surprisingly, they are generally answered as “Hüsnü”. He is always improving his old school style for clarinet with academic work and integration. I have listened to Aytaç Doğan first time yesterday. He is just great. I will surely follow him more closely. The performance has started with the quintet version. The piano entrance of Kristjan Randalu was great again. His style is really as soft as silk. Audun Erlien was always there at the back with electric bass – strong and solid with the drummer Chander Sandjoe. Different that the previous concert, Chander Sandjoe was a bit more silent. The solo performance of Kristjan Randalu in around middle of the concerts, I think, is the most important highlight of the night. Eivind Aarset was responsible almost for all electronic background. He, with his laptop open in his front, was a great ingredient in the resultant beauty. The overall sound was amazing. I should mention here that the previous concert’s hall and the square of Cer Modern have very poor acoustic conditions. However what I have experienced in the previous concert in Meb Sura Hall was the best I have ever heard at that place. Same has applied yesterday and I, again, have listened to the best sound created in the square so far. It is obvious that Dhafer Youssef is caring about that and the sound engineer from Berlin (he was in Ankara for both concerts) has a big contribution in that. This experience forces me to make a comment that if musicians care about the good sound then the good sound is achieved. 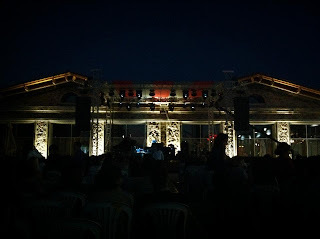 The entrance of Hüsnü Şenlendirici and Aytaç Doğan to the stage in later performance was good and bad at the same time. Aytaç Doğan was the shining star of the day. He was like playing all the time with Dhafer and the band. The way he is carrying the melody in his solo performance was incredible. It’s the first time I am listening to Hüsnü Şenlendirici in such a configuration; but I can easily say that especially in the first parts, his accompanying to Dhafer Youssef’s high register vocal was not successful enough. From beginning to end there was also a serious clip-like problem in the sound of clarinet. Especially their intense duo performances in high frequencies are generally destroyed with this unwanted noise. However, I should admit that Hüsnü Şenledirici was just like a master in his solo performance and their duo with Aytaç Doğan. Moreover, the following performances of Hüsnü Şenlendirici with the band were better. Ankara audience had a real good participation in the concert considering the holiday time and ongoing Ramadan. As far as it is seen in the ovation part they liked what they listened to.